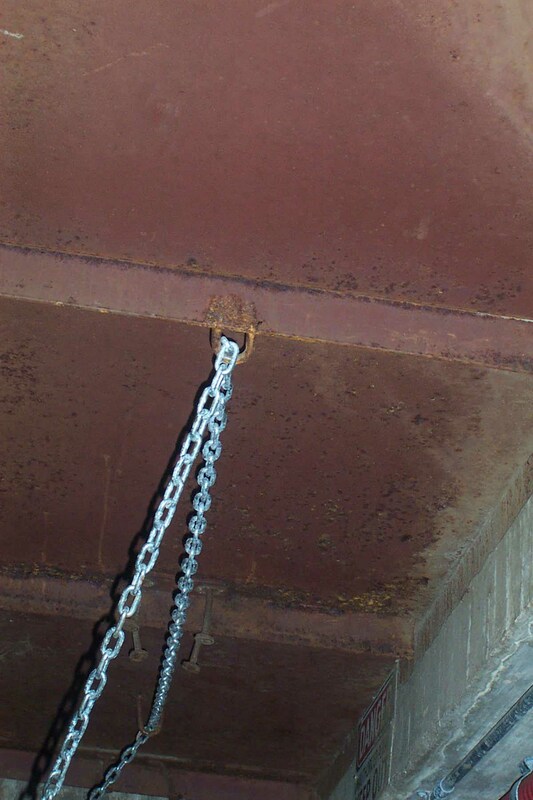 The chained underside of an access panel. Cheapskates. At many times, as we went deeper, we heard banging around somewhere. This was either the solenoids in pipes near the Physical Plant, or people walking over access panels overhead. It still freaked us out at first, and I have several minutes of just blackness on the videotape, as we spoke in whispers about what to do if overtaken by the gremilins, c.h.u.d.s, Its, or whatever the heck else was stalking us. 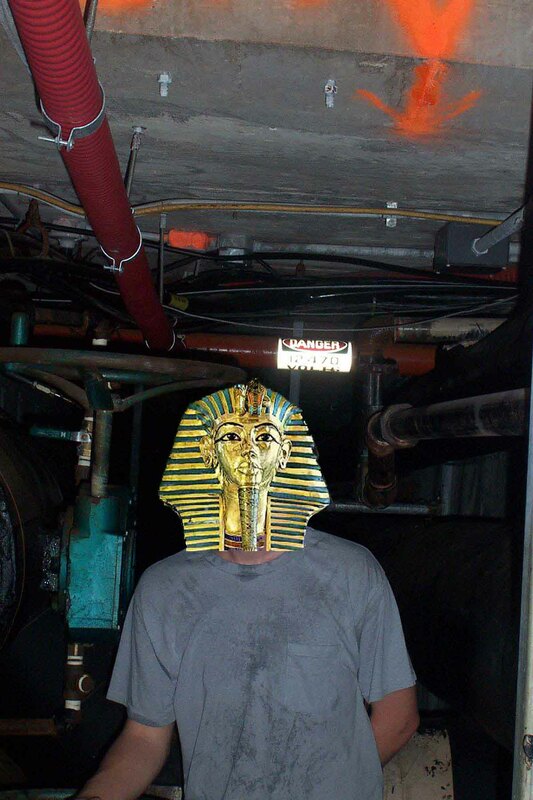 But I remembered the documentation by Reverse Logic on the College Tunnels site, figured it must be the solenoids, and deduced we were pretty near the Physical Plant now. We reached an intersection in the tunnel, where a smaller pipe crossed our path. There was a little ladder, like a style, over it, surrounded by a bunch of buttons and guages and wheels that I was hoping we didn't disturb as we climbed over. I handed the camcorder to Osiris and went over, then filmed him climbing over. I then started down the tunnel again, but he told me to come back for a second and look. I did and what he had found was a whole new passage connecting to the main one; it was hidden by this little partition, and all the wheels and knobs. 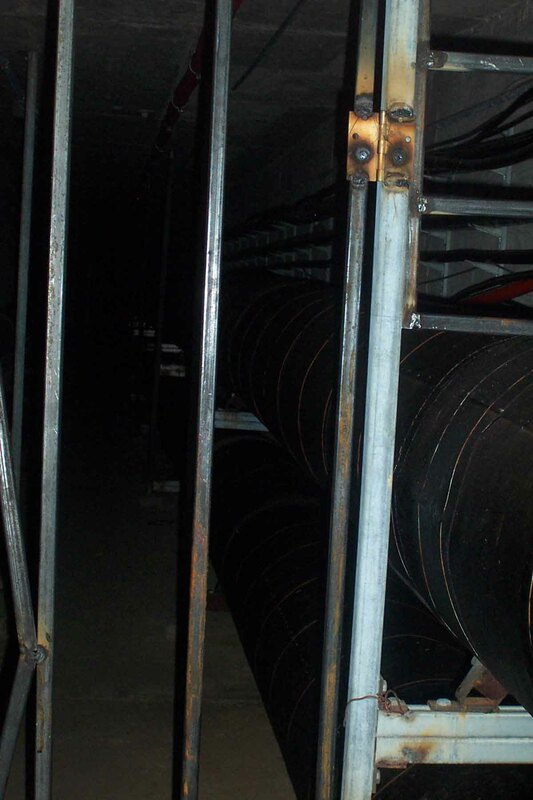 You could only see it if you knelt down and peeked under the intersecting pipe. I thought that the smaller pipe was just imbedded in the main tunnel wall, but it had its own tunnel and I didn't see it. Actually, the smaller pipe did come out of the wall on one side, and went into the new tunnel on the other side, so the intersection was a T, not a cross. This is another good reason to go UEing with friends; they might see what you miss. The new tunnel was smaller than the main one. We looked into it and saw rows of lights in the distance. We decided to continue on down the main tunnel and come back to it. We kept going, and there was little change in the tunnel layout; same huge pipes, still going down, with access panels every now and then. We counted four of those, I think. They were all chained down from the bottom. There was a big chain that went through steel loops on the underside of the panel and went down to a padlock on the wall with ribar through it. So now we knew why the stupid things would never open. Eventually, the tunnel leveled out, then it turned to the right. It only went a little farther after this before coming to another gate. This one was locked tight and the bars were way too close together to squeeze through it, packs or no packs. We were disappointed. On the other side was an open space which we could delineate because of a light on the other side. The light was above us, like it was on a platform. I think it was some kind of control station for the system, and I think we were pretty close to the Physical Plant. I'm afraid we did not take any pictures of this, because in our excitement at slipping through the first gate, we left the still camera behind with our packs. Pictures would have been crud anyway. Back to the intersection. We climbed down under the smaller pipe into the narrow passage, with the lights in the distance. The heat immediately shot through the roof. It had been pretty warm in here from the start, about 80-90 degrees we thought, but in this more enclosed space it was like walking through steam. It had to be 120 degrees, with the steam lines inches from our bodies the whole time. The whole time didn't prove to be long; we backed out before we had reached the lights. It was too hot, and we couldn't see the end of the tunnel. 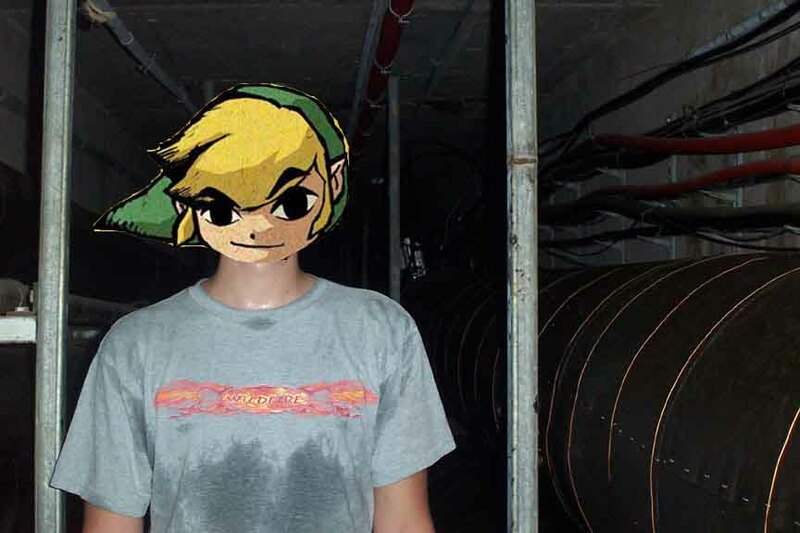 I am almost certain it led to the basement of Kimpel Hall, one of the largest structures on campus, but I may be wrong because of the intense heat. We retraced our steps back up the sloping tunnel, slipped through the gate, and got the digital camera. We zipped back down a ways to get some pictures, but didn't go all the way to the end again. Then we grabbed our packs and returned to the entry point. We stayed there crouching in the shadows and listening for passerby, then scrambled up the pit walls and out of the construction site. The camcorder's batteries went out pretty quick; I only got about 15 minutes of video. We also got 14 pictures. We might have gotten more if we a) had remembered to take it with us all the way in and b) hadn't borrowed it from the control room of a church which will remain unnamed and been all worried about breaking it or having someone miss it and getting Osiris in big trouble. If we ever find a way back down there, it will be difficult to go very far, because they have the whole place tightened down and partitioned off with gates. 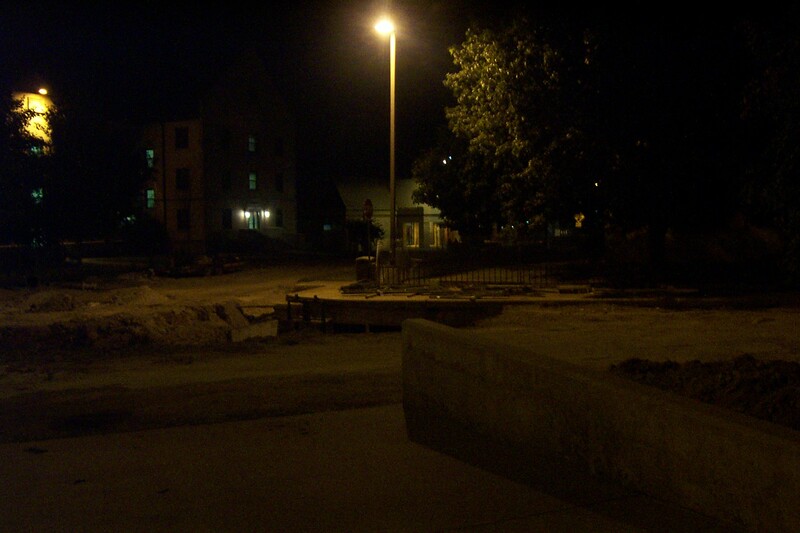 I guess there probably were people down there in the past 6 years, and the Physical Plant workers got tired of it. Ah well. We've had our day, fulfilled our ambition and proved ourselves as urban explorers.